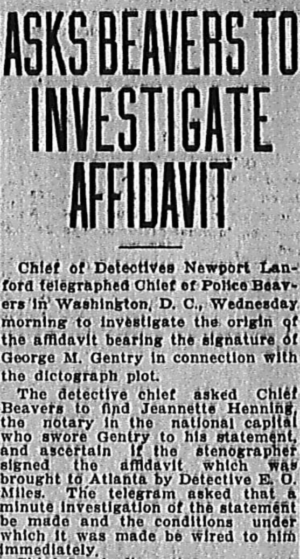 Chief of Detectives Newport Lanford telegraphed Chief of Police Beavers in Washington, D. C., Wednesday morning to investigate the origin of the affidavit bearing the signature of George M. Gentry in connection with the dictograph plot. The detective chief asked Chief Beavers to find Jeannette Henning, the notary in the national capital who swore Gentry to his statement, and ascertain if the stenographer signed the affidavit which was brought to Atlanta by Detective E. O. Miles. The telegram asked that a minute investigation of the statement be made and the conditions under which it was made be wired to him immediately. Chief Lanford’s action was taken following his declaration that he did not believe the affidavit genuine. Lanford stated as his belief that the stenographer’s name had either been forged or that Gentry has been coerced into signing the document. Police officials have also conducted a rigid investigation into the standing of Detective Miles. Miles, the investigation showed, is at the head of the Reed Detective Agency. Thomas B. Felder was at one time one of the largest stockholders in the agency, Carl Hutcheson being also a stockholder and attorney. He it was who appeared before the Police Commission and urged that body to grant the permit from the agency’s operation in Atlanta.